Plants as supercapacitors; room-wide wireless charging; superionic electrolyte. 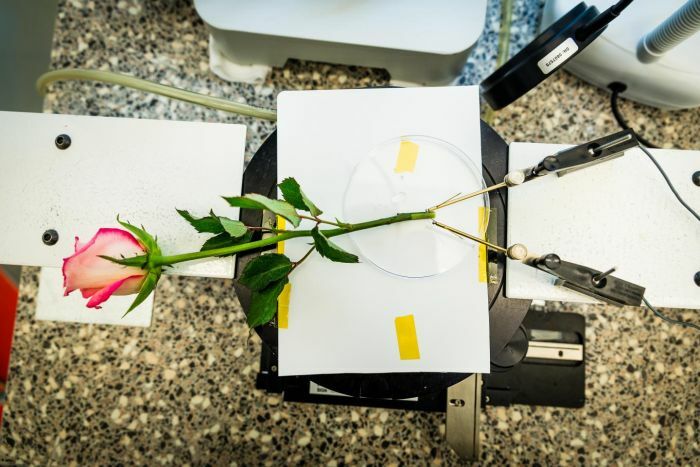 Scientists at Linköping University in Sweden developed a method for transforming roses into supercapacitors that can be charged and discharged hundreds of times. The team created a solution that, when fed through the cut end of the stem, polymerizes inside the rose’s vascular system with the plant’s own biochemical response mechanism acting as catalyst, creating long, conducting threads throughout the plant from the stem out into the leaves and petals. With an electrode at each end and a gate in the middle, a fully functional transistor was created. “We have been able to charge the rose repeatedly, for hundreds of times without any loss on the performance of the device. The levels of energy storage we have achieved are of the same order of magnitude as those in supercapacitors. The plant can, without any form of optimization of the system, potentially power our ion pump, for example, and various types of sensors,” said Eleni Stavrinidou, assistant professor at the Laboratory of Organic Electronics at Linköping. While the development of electronic plants is still very new, the team sees eventual applications in the areas of autonomous energy systems and distributed, interconnected sensor–actuator systems. 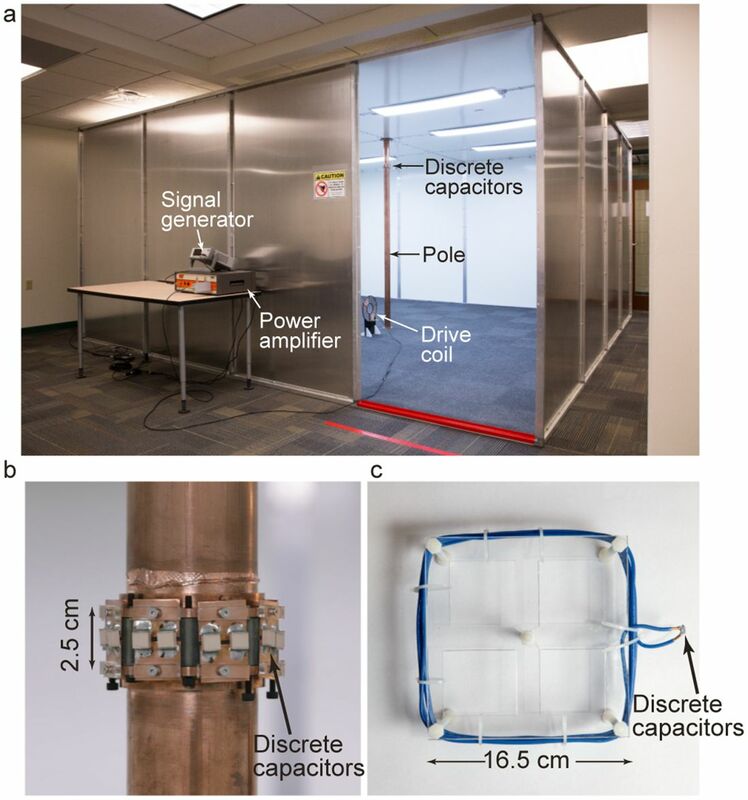 A team at Disney Research developed a way to wirelessly transmit power throughout a room by generating near-field standing magnetic waves that can fill a room, making it possible to power several cellphones, fans and lights simultaneously. The downside: it requires a copper pole to be placed in the center of the room. The method, called quasistatic cavity resonance (QSCR), involves inducing electrical currents in the metalized walls, floor and ceiling of a room, which in turn generate uniform magnetic fields that permeate the room’s interior. This enables power to be transmitted efficiently to receiving coils that operate at the same resonant frequency as the magnetic fields. The induced currents in the structure are channeled through discrete capacitors, which isolate potentially harmful electrical fields. “It is those capacitors that set the electromagnetic frequency of the structure and confine the electric fields,” Chabalko explained. Devices operating at that low megahertz frequency can receive power almost anywhere in the room. At the same time, the magnetic waves at that frequency don’t interact with everyday materials, so other objects in the room are unaffected. University of Illinois chemists developed a superionic solid formed of copper selenide nanoclusters that could be the basis of next-generation lithium-ion batteries. The liquid electrolytes common in batteries require volume, degrade as the battery cycles, leak, and are highly flammable. Though solid electrolytes are considerably more stable, ions move through them much more slowly, making them less efficient for battery applications. The team’s copper selenide nanocluster electrolyte combines the best of both liquid and solid electrolytes: It has the stability of a solid, but ions easily move through it like a liquid. Copper selenide is known to be superionic at high temperatures, but the tiny nanoclusters are the first demonstration of the material being superionic at room temperature. The researchers discovered the superionic property by accident while investigating copper selenide’s surface reactivity. They noticed that ultrasmall nanoclusters – about 2 nanometers in diameter – looked very different from larger copper selenide nanoparticles in an electron microscope. The reason for the semiliquid, superionic property is the special structure of the nanoclusters, Jain said. The much larger selenium ions form a crystal lattice, while the smaller copper ions move around them like a liquid. This crystal structure is a result of internal strain in the clusters. The researchers are working to incorporate the nanoclusters into a battery, measure the conductivity of lithium ions and compare the performance with existing solid-state electrolytes and liquid electrolytes.